Silk-reeling exercise is really about taking a small segment of the Tai Chi form and converting it to a symmetrical/continuous movement. One then can concentrate on practicing just those few movements. This is of course different than practicing the Tai Chi form which as we know is huge in scope. So then we have reduced things to a very simple motion and can just work on that. This concentration is really concerned with the kernel of the movement and goes to the heart of it which is the internal. So these are not easy and some of them are extremely advanced. Talking of these movements we see that practitioners in old times did not begin silk reeling until after about 10 years of experience. Now however and in consideration of improved teaching methods we can teach beginners and see that people do get it and enjoy it. It is quite convincing that anyone you want to teach can incorporate this as part of the teaching program. This incorporation can be in parallel to the teaching of the Tai Chi form so this can maintain the interest of the students. A movement which is considered the most advanced but is really quite simple to learn is moving the hand in conjunction with the body. The hand becomes a slave of the movement of the body and does not move independently. With either the right or left arm hanging down at the side you slightly stretch it down at the shoulder. I repeat "slightly" for you do not want to bend the body itself as you stretch. One can concentrate on the elbow and slightly stretch at the shoulder as you do this. Then you move the body on the right or left side to move the arm. Ask yourself if you feel the connection between the arm and the abdomen at this point. There is a common mistake which occurs when that movement is taught. This mistake occurs when students start bending the arm at the elbow. Once the elbow is bent, you immediately lose the connection between abdomen and arm. This loss of connection occurs because your concentration goes to the forearm instead of to the body. So the whole arm has to move like a unit and not bend at the elbow. In observing students try this, one also sees them angling the arm across the front of the body from right to left side or left to right side. You should try to keep the arm moving straight ahead and not across your front. Other mistakes I observe are students drooping the engaged shoulder, sometimes drooping one entire side of the body and even cocking their head down as well. If you observe the students in this Youtube video you will see what I mean as well as what to avoid. One can "scratch their head" but Tai Chi is hard work. In the previous blog, you can hear Master Hwa say this as well. Teaching Tai Chi is hard work. Writing about Tai Chi is hard work. Those aren't my opinions, those are my experiences, something I have done for a long time (they are not my "feelings"). 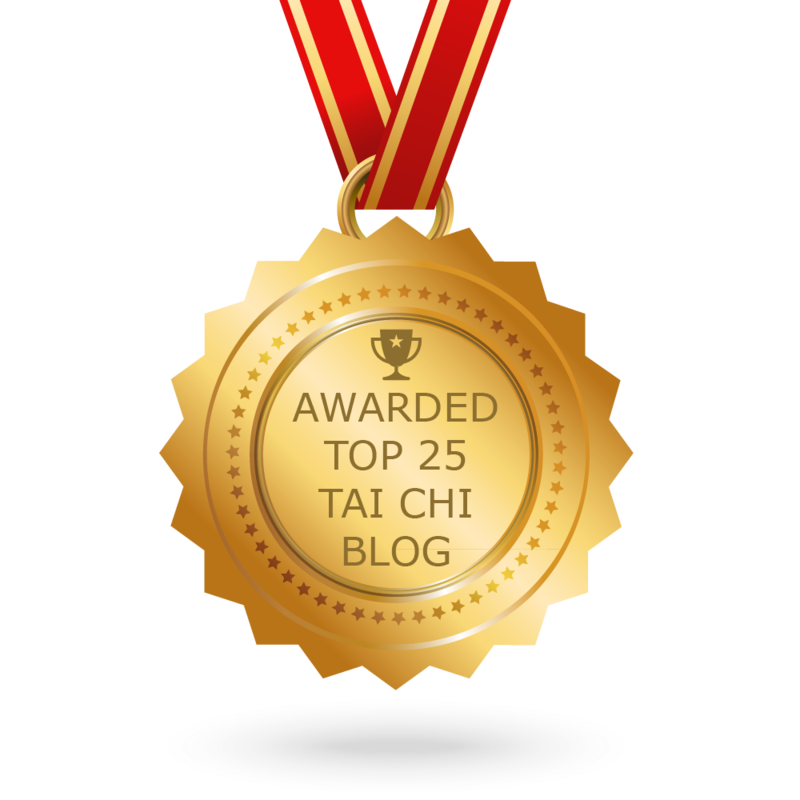 Here is an example of the importance of hard work in writing about Tai Chi as well as taking personal responsibility for it: I received one comment from “anonymous” on a recent blog. This in spite of my written statement that comments signed “anonymous” will be immediately deleted, which I did. Quite honestly, I don’t even remember what was said. Writing is indeed hard but my finger on the delete key is like lightning. As the author of this blog, publishing comments signed “anonymous” are a difficult thing to do. As I said previously, I have enough difficulties, I do not need anymore. I think of Master Hwa saying "I want to simplify my life". I am in solidarity with him on that. If this were not a democratic country or there was some similar scenario that gave birth to burning social issues I could understand and even appreciate "anonymous" authorship. On the other hand, if I am the author of any comment, much as I do with this blog, I take ownership of what I write. In other words, I have to stand by my words, I am accountable for them. Master Hwa has been kind and pointed this out to me when I have strayed too far afield. He also signed his name when he told me this. Now it is my turn as a teacher to pass this "accountability" on to the student or student(s) that write but wish to remain "anonymous". It has even been said that anonymity “calls into question the very validity of words without an identifiable author”. Let us not bring into question here how hiding behind anonymity provides an excuse for bad behavior. Let's skirt the question of how easy it is to remain "anonymous" and how one might wish to avoid the "hard work". Why do you expect a Tai Chi teacher to compromise this or a writer for that matter? Don’t you see that its usage brings problems into what you write? If you tell me who you are, you will be treated as a human being, you will lay claim to your own authenticity and what you say will be treated as having meaning. You are “anonymous” because you want to remain “private”? You wish everyone to see it on the internet but you want to remain private? I wish to have my cake and I want to eat it too. Some sites will allow you to do this but there also many sites with many good reasons (this one too) for banning and deleting anonymous comments. A quote by Master Hwa comes to mind: “ I don’t understand the reasoning (thinking or reasoning ability) of modern day Tai Chi practitioners”. If you wish privacy and anonymity it only demonstrates confused reasoning. The better reasoning would be not to participate at all. This blog, is mine and as with most others are not icons of democratic ideals, due to private ownership and accountability…(this blog is not a democracy, although it is written in a democratic country). You can quote me for I take ownership. Much like people cannot come into the house I "own" and do or say what they wish. years, Tai Chi is not easy, it is hard from beginning to end. beach ball into water may be more apt to one's experience. experience and I am pleased to say I own what I say about it. I have found that Tai Chi is difficult to learn but conversely it pays off quite well for the time and energy invested. In the Tai Chi form for instance, there is no gradual increase of learning from easy to hard. Quite frankly, it is difficult from start to finish. On the other hand there are movements which are quite economical in scope. In this economizing of effort one can literally learn and train numerous facets of both form and delivery of power at the same time. 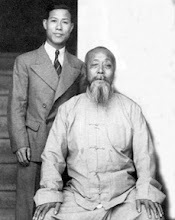 In the photo it illustrates Master Hwa using "Cai" or "Yank" at the same time he kicks at Tom. In the Tai Chi form there are several different moves to practice "Cai" and some of those have slightly different applications. In this Youtube video (click the link please) I present a clip of a 2011 workshop. In the clip, Master Hwa talks quite extensively about the difficulties one faces in learning. He also discusses "economy" of learning. Practicing the movements from the "kicking" section of the form one sees a good example of this economizing. Namely, the hand movements practice "Cai" or yanking, while the foot movements practice the kicking routine. He points out that many movements in the form are designed this way. In other words, one limb practices a move for a particular purpose, while the other limbs practice for some other purpose. This is indeed a very economical design that packs much practice opportunity into the 108 Long Form. I recommend the learning of any movements with the same structured approach. I would learn direction, hand/foot position, timing, internal discipline for any posture in that specific order. It makes no sense to start doing a kind of silly attempt at Fajin for a posture if one has incorrect hand or foot position for instance. I say "sillified" because as we already talk about how hard Tai Chi is, one's efforts will be compounded if there is no logical progression to learning. So, for the kicking section, one has to know what direction(s) they will both move and kick in. Master Hwa talks about keeping one's balance while both kicking and yanking. If one does not have direction, hand or foot position, and timing, it stands to reason there is probably some balance issues involved in the fault. In other words it is hard enough to stay balanced while standing on one foot, much less complete a yanking movement with the arms...don't fool yourself that you "got it". Particularly so if you keep losing your balance every time a shoddy "fajin" yank results while you are kicking. You can break down the kicking and just practice kicking with no use of arms. Then when you get good to very good balance... add in the "Cai" movement. Keep putting the cart before the horse only confuses the horse does it not? One ends up going nowhere very fast. I do not normally speak to beginning students of this for they certainly have enough on their plate. Perhaps it will help some few to see where we have been and what to avoid in order to see where we are going and thus what stage you are at in learning Tai Chi? We speak of stages in the learning of Tai Chi and the first stage is to take command/control of the torso. In this stage you will learn to differentiate between what is moving (yang) and what is non-moving (yin): In other words what part of the body is energized and what part is relaxed. Contrary to what is commonly thought, the indication is that one can relax only if one achieves some energizing. In this regard, one's attention will concentrate on the energized and not on the relaxed part of the body. In other words, if you have no intent on certain parts of the body and no sensation of feedback (feedback from movement) then those parts will become relaxed. An example of this is the student who tried to relax his shoulder by concentrating on relaxing that part of the body, focusing on the shoulder. Here we have a classic "did the chicken come first or did the egg" kind of problem. By focusing on the shoulder, the student had so much attention on the shoulder that it kept that part of the body moving. If the body is relaxed then energizing and energy flow will fluorish and if the body is tense then it will not. However, the problem is summed up by one who in asking for directions to Carnegie Hall, was given directions to practice, practice, practice for there is no easy route. One can achieve these higher levels but speaking from experience it does take years, particularly if one does not have consistent access to a teacher. In discussing stages, Master Hwa tells me in passing that my level of internal energy is higher than his when he was at my stage. This is not to gloat or brag but simply to stress the point that even distance learners can not only progress but also achieve high levels.. What has been achieved in distance learning is due to Master Hwa's caring, straight forward, but no nonsense and intensely comprehensive course of study presented in Classical Tai Chi. The number of years will tell you that my part in the process was to persist and practice, practice, practice. In all humility he will tell you he also sees a direct conduit to his teacher and the teachers who went before. This has not been easy, partly because I never took regular weekly and in-person classes with him. There were private classes on numerous occasions but largely they worked to reinforce what has been learned from the DVD. I hope I am not letting the cat out of the bag but I noted early on that he does not spoon-feed students. I say "...letting the cat out..." regarding the learning for I think that most students do not realize this is happening. He tells me something once and I make it a point not to continue on with the mistake. Of course there have been occasions where I did hear what he was saying but I did not listen and I realize (later to my chagrin) that I finally snapped out of it. I don't believe that he dislikes people because of these foibles, on the contrary I know that he seems happy that students make effort to persist. The recorded lessons are not perfectly comprehensive for one would need volumes more to hold it all. One hears his in-house students speak of things that he did not elaborate on in the DVD series and I am temporarily taken aback, for I thought differently. On the other hand I was able to fluorish early on with just the DVD's and outpace even the in-house students in several aspects. What went before is study of what I call external style Tai Chi for some time and that helped in some ways but it has hindered me in others. It is still difficult to forget some of the things that were learned previously for that has involved a weeding out process where I culled what I thought things should be and what they actually are with no illusion. Without a doubt and aside from what little contribution I make here, I also feel that writing has helped a great deal with the weeding out process. The eventual goal is that one will make all movements internal and integrate them with the arms and legs. This is so that one can achieve the ability to "use internal movement to direct one's external motion". Internal energy circulates in the body with no stopping or breakage in the the flow. You can then play the form without thinking, it is subconscious and any attempts to integrate internal movement into your everyday life is easy. So as you see in my second paragraph, there is an intensity of struggle and engagement in the beginning stages. Now, as he has stated, the mind is free to enjoy feelings of pleasure from the movement. I am talking about, real ( not imagined or visualized ) feelings, sensations of stretching and energy circulation in the body. When I speak of internal "energy" I am referring to the tactile (as in touch) sensations that one feels when moving any area of the torso. I am not referring to the many other definitions attributed to the word energy such as "force of the universe", etc., etc. The tactile energy is also defined by its continuity of movement, its flow and circulation. In a relaxed body, it can keep "going and going and going", flowing and flowing and flowing to recoin the popular phrase about the Energizer Bunny. Inevitably in talk of energy, students talk to me of their Qigong or speak in terms such as "well in Qigong one does this or one feels that". But really I find that my state of mind (at this level of achievement) when doing the Tai Chi is indistinguishable from any of the motion induced Qigong practice I did in my previous Tai Chi training. I would say that the present state of mind is that of Tai Chi and Qigong being one and the same. Herein is the danger for beginning students, some of whom may have read books, articles, or watched video about the subject of Qi (Chi). I see there are many teachers, books, videos out there that bring emphasis about Qi way too early for beginning students. Aren't they overwhelmed and confused enough? Do we have to browbeat them into learning by overloading them to the point of submission? My teacher speaks of students being only part of the way into the learning process yet talking of Qi, Qi, Qi. In his book Master Hwa further states that "enamored by the glamorous and mysterious qi, they start to dabble with the advanced visualization (note his use of the word visualization) qi gong exercises or mind-induced qi gong in contrast to safe, motion-induced qigong such as Tai Chi. Without a good qigong teacher this may lead to the wrong path. Here is a video link to an excerpt wherein Master Hwa speaks of the dangers of visualization Qigong: Link to Visualization Qigong Problems could include uncontrollable spasmodic motion (people start jumping around, waving arms, yelling, singing, screaming, rolling on the floor) or the more serious qigong psychosis which is now included in the DSM-IV (as a "culture bound syndrome"). I have personally witnessed these types of spasmodic body motion reactions, singing, yelling when I visited a Qigong session at an Acupuncture clinic. The well known acupuncturist (featured in Forbes Magazine and treated the NY Giants football team) said: "I know you do Tai Chi but come to my clinic tonight, you have never seen Qigong like this". Watching the group from a seated chair outside their circle I observed various individuals move uncontrollably as I describe above. When I say uncontrollably, I mean exactly that, for in one case I saw an obese woman bending and flopping her arms to touch her toes from a standing position. I see no way someone with such girth could do that completely of their own volition, for in watching her enter the office, she could barely walk due to her weight. 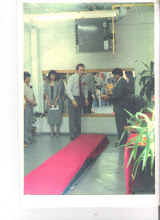 The acupuncturist was using "external qigong" and directing it at the patients. The external qigong came through the physical movements of the acupuncturist as he moved in and around the circle of patients and it induced such uncontrollable movement in their bodies. The acupuncturist also taught visualization Qigong to the patients and they (according to his statements) were visualizing the Qi while he treated them. In my estimation, unless one has the right teacher (not found in Classical Tai Chi curriculum, we do not teach these practices) one should steer clear of practicing these "visualizations" on their own. I conclude by saying as does my teacher: "The best approach for the student is to practice Tai Chi Form or silk reeling exercise without any conscious thought, (conscious visualization, conscious imagery) or hidden longing about qigong. Just enjoy the sensation of internal energy (tactile sensations) circulating in the body and let qi come naturally"
Master Hwa tells me that he receives a lot of discussion after people see his DVD’s and the Youtube videos. During a recent workshop he talked a bit about this and the question which seems to be central to the discussion: “Can I incorporate internal discipline into MY form”? I have “incorporated” some great deal of what he said on that subject in this blog and it is almost verbatim. “Can I incorporate internal discipline into MY form”? Now there is a question that shows practitioners want to get into the real “nitty-gritty” of the movements and not just have ethereal discussions or talk of whether MMA can beat Tai Chi, etc. He also talked about this with me when we shot the DVD called “ Tao of Martial Applications”. The conclusion is one really cannot “incorporate”, like some have asked this , even those who do Wu Style. At the time of the initial discussion on the DVD, we really did not pinpoint why you cannot do this. Why can’t one incorporate internal discipline into other people’s forms? He tells me that when he wrote the book “Uncovering the Treasure” and he had to rethink this discussion, he found that you really have to have the correct body structure to incorporate the internal discipline into other people’s forms. The reason why people cannot do this is that they have the wrong body structure. There is also a misunderstanding of not only what is wrong with their structure but also what is the most important component of the body structure. This most important component is the forward lean and it is really central to the discussion. It is so important to your health that one has to constantly insure the body structure is correct. Outside practitioners do it with the body perpendicular and the spine is compressed too much. The correct way is to lean and stretch out the body. He wants all of us students to experiment with variations from this leaning posture. One variation is certainly bending your back and making yourself perpendicular. Now you do not have the stretch. Another variation is to turn your rear foot, like most practitioners do, 90 degrees to the side. You do not have the stretch here either. Another variation is to raise your rear heel. As I do these experiments (very carefully) myself I am reminded of my many early days of studying “Yang” Style, “Taoist” Style. In those studies, I recall vividly and somewhat painfully how my knee pains were a result of turning that rear foot 90 degrees to the side. It seems now as it did then that this conclusion was not a result of “rocket science”. Yet, there seemed to be no teachers who would agree with me. Perhaps it did not bother those teachers who had started Tai Chi when they were 6 years old. One wonders how long they can continue down that path however. Like the great dancers who started (turning out the feet) when they were young and speak now in their middle age of aches and pains in the joints. I have met a few who tell me they are grateful for this body structure where one does not turn out the back foot. Sorry, I digress but the second point besides the stretch is that the body weight has to really be on the front foot during the forward lean. If you shift back a little bit, you lose some of the stretch. So with all of these slight body posture variations, you will not achieve the result. Also, we usually start going to this posture from a sitback posture. If we do not lead into the leaning posture correctly, we do not achieve the stretch. To lead correctly, the front foot pulls with the abdomen pushing in to itself, the “internal discipline” of the movement. Once you reach the endpoint, you naturally have that stretch. A variation of this is to do it incorrectly by pushing from the back foot and you will not reach the “endpoint” correctly. The corollary is when you have the stretch, you feel like your body is connected as well as stretched from the top of the neck to the heel. You feel that you have no break in the stretch, when you stand perpendicular, you have a break in the small of the back. Now when you are stretched like this and there is a force coming at you that force will go down to the ground without absorbing in the middle of the body. If you are perpendicular, the force will absorb in the middle of the body and likely hurt your back. Also, if you hit someone from leaning and stretched, the rebound force will go through your body and into the ground, not so if you stand perpendicular. So the stretch becomes/is the indicator that your body is the right posture for both delivering and receiving the force. This is really more important for the health viewpoint, this forward stretch. If you give more work through stretching thusly, lower back problems will gradually improve. If you tuck your chin in , you also stretch your cervical vertebrae. It is good for cervical spine problems to stretch in this manner. So this is almost a central theme that you will be able to have your energy transfer from the neck down to the heel. The energy can flow through the middle of the body without stopping at the spine. This will just transmit all the force to the ground. Do you see how this lean is such a very important component of the body structure? 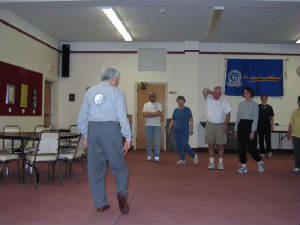 The Blog article "Your Tai Chi Roots" is found at classicaltaichi.blogspot.com and (along with many articles) is located at the upper left corner of the page Other sites of interest include www.classicaltaichiofbuffalo.com and my teacher's great site at www.classicaltaichi.com. In (search at Amazon.com) the book "Uncovering the Treasure" by Master Stephen Hwa, he makes reference to a peculiar phenomenon that occurs when one demonstrates Tai Chi Form to students. "...their attention will always be attracted to the upper body movements first and neglect footwork." As a teacher I make it a point to address this issue and I take measures to pinpoint their concentration back to footwork. In both the figurative and literal sense, Master Hwa refers to footwork as "...the foundation of movements." I get much inspiration from my annual trips to the wondrous Adirondack Mountains and forests of NY State. 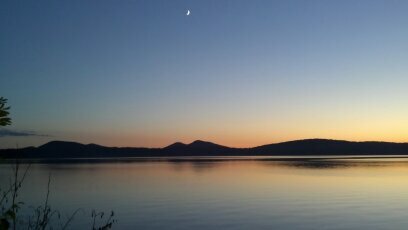 In hiking the many trails of the Adirondack Forest each Summer my attention is honed to a laser sharp point. 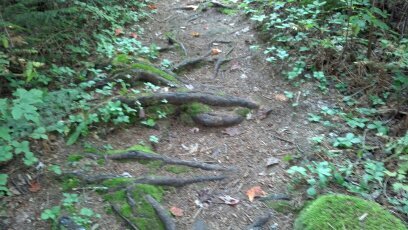 I speak of the many twists, turns and never ending obstacles that one comes across in any walk. As just one example of maintaining concentration, one is forced to watch for the obvious and not so obvious "roots" in the ground but one has to also keep the upper body relaxed. The upper body has to be kept relaxed with hands and arms able to fend off rebounding branches, and if you are walking a dog there are additional concerns. In the "Tai Chi Walk" exercise (see this link to video) students get a first lesson and a truly visceral understanding on how to delineate between what is moving and what is still in the body. Please go to www.youtube.com/parea10 to see this video as well as many others. This is none other than the delineation between Yin and Yang for a student's first experience. As Master Hwa states: "This is the first lesson on how to keep clear a differential between the energized and the relaxed parts of the body working side by side". The problem in both the Tai Chi studio as well as on the Adirondack hikes however, is that most people find difficulty in keeping the upper body relaxed. In traversing over those many Adirondack obstacles I find many appropriate "lessons": Proper body posture, proper foot position, proper body weight distribution as well as learning a very unique walking dynamic. In other words, "roots" are excellent teachers and always give good lessons. I sometimes take this methodology into the Tai Chi studio, having students step over objects placed on the floor but doing so only using Tai Chi Walk. Thus bringing our "roots" for training into the studio as well. Use core power for the movements of the legs and this encompasses lifting and stretching the legs. How to keep one's center of gravity under control. One does not revert to "controlled falling" which is the mainstay of the everyday, common walking movement. One learns to pull the body forward or backward and not push with either leg. This last characteristic involves using the "contractive" power of the core. Specificially one contracts the lower abdominal muscles and pulls with the lead foot to move the body. This characteristic is sometimes described as a sensation of feeling the entire body "sucked" forward or backward with no accompanying and overt sensation of muscle strain in the legs. Normal walking pushes with both front and back feet to provide for movement but it also "...engages both feet stuck to the ground until the body completes its move". This is commonly referred to as a form of "double-weighting" and besides being an entirely "external", not an optimum body position and it does not qualify as a "Tai Chi" movement. One's center of gravity is not under control. The "controlled falling" of everyday walking can often spiral out of control with the individual losing their balance and sometimes falling. The loss of balance in such situations, for instance, can partially be attributed to the uncontrollable momentum force that occurs in a body that walks very fast. One often sees this at street corners when people "lurch" off the curb in their zeal to get places in a hurry but do not concentrate on what they are doing at the time. One certainly does not want to add to the incoming force of an opponent that is coming at you by pushing your own body back with the front foot do you? In Classical Tai Chi, this push is sublimated by the Tai Chi Walk training and one "pulls" in order to adhere or stick to an oncoming opponent. This allows you to neutralize the oncoming force and not be bowled over as the front heel (not pushing) acts to also absorb some force. Certainly "pushing" with either front or back feet is "natural" for us ever since our parents encouraged us to stand up and walk. In Tai Chi paralance however, the "push" is further developed in what is referred to as Large Frame Form. Everyday walking with the "push" motion is always the culprit when one slips on ice and falls. The scenario is always where one lands the weight on the front heel with the back foot pushing off on the toe. This is the template for disaster. Using the "pull" eliminates these kinds of mishaps. I encourage you to adopt the Tai Chi Walk as the overwhelming favorite to replace "Everyday (controlled falling) Walking". Keep the "characteristics" of Tai Chi Walk in mind but you do not have to walk as though you are actually doing a Tai Chi lesson...this would be a bit sillified. The object is to generate internal movement, that is powered by internal energy but controlled by internal discipline. I find that I now do this on my everyday long walks with my family and our dogs. One of the keys to doing this is "keeping the weight back" in order to control things. The Tai Chi Walk is truly both the literal and figurative path where one takes the "first step of a thousand mile journey". "I have two of Master Hwa's DVDs and I find his concepts fascinating. I am a practitioner of Wu Style TCC (disciple of the Wu Family). However, we have been taught that all of the movements are generated by the "hips" first, not the "waist". I still do not understand why Master Hwa thinks that the hips should remain less mobile than﻿ the waist. The hips are the fulcrum of the body and connect the upper with the lower." I have never understood how people can say things like "all of the movements are generated by the hips first, not the waist", "turn your hips", "push him harder so that he can turn his hips", etc. I heard those refrains for years in studying large frame Wu Style and years before I started Classical (Wu Style) Tai Chi. The hips are a large and complex joint of the body and like any joint are necessary for movement. They are necessary for movement but not sufficient in and of themselves to power or “generate” movement however. In other words they do not move in and of themselves but move as a result of action initiated by other parts of the body. Stating that they are "the fulcrum of the body and connect the upper with the lower" still is not a sufficient explanation of what powers or “generates” their movement. A crowbar is a lever that can be used by itself or with a fulcrum that is properly positioned but without a source of power “generation” it is just a metal bar and the fulcrum sits unused. Another thing I do not understand is how people are so blase' to the idea that "turn your hip" violates the Classical rule "hand follows the foot, elbow follows the knee" and how this is perpetuated through generations. The worst picture is turning the hip with the back foot stationary and pointing 90 degrees. This drags the practitioners energy backward. One only has to look at a golfer's stance where the legs stand at right angles to the direction of the golf stroke. Tiger Woods perhaps is a sad example, didn't he most recently have knee surgery? Look at his much admired stance, didn't the damage come at the knees? There is tremendous torque and twist at a golfer's knees as in Tai Chi when the rules are broken. This classical rule about "hand follows the foot..." is obvious in the Tai Chi form but since lots of practitioners give the form such short shrift perhaps this rule does not occur to them when they do applications or free style fighting. I would also surmise they do not care that they cannot incorporate internal discipline into their fighting either, much less their form. On the other hand, perhaps they simply do not know or never took the time to learn the rule. When is this rule applied? It is to be applied when the act of turning the hip would violate the rule pure and simple will create a "torque" or "powerful twist" in the knees and ankles. One can see a grimly humorous aspect to this, where the opponent simply waits for you to injure yourself, what work do they have to do at that point? See how health and martial should correlate here? There is much more power when the rule is followed however. Also, we can just turn at the waist without turning the hip. I fail to see where there is more power from turning the hip with feet in a static position. I fail to see how this will not eventually end up hurting the practitioner, even though they crow, " I got him down to the floor", your knees and ankles will pay the price. The generation of movement for our hips comes either from our legs or from our waist and not from the hips themselves. The generation of hip movement from the waist also comes with its own set of problems as does the movement of the hips from the legs. See the attached video for examples of what happens when practitioners turn the waist and the hips at the same time. In large frame Tai Chi the movement of the legs to turn the hip is called "folding the hip or kua". A leg pushing the body either forward or backward makes one hip rotate into itself and the other rotate out of itself...hence the inguinal "fold' so coveted by large frame practitioners. As far as "Power" is concerned, one will reduce or drain off power when turning the "hip first" (which as we said is really an oxymoron and impossible because it does not generate its own movement). Keep the hip still , turn the waist and then try another experiment where you turn the hip "first" (impossible but you can turn the waist to turn the hip) and you can readily see the difference in the "generation" of power. What exactly is the mechanism that is used to move in and of itself when one is urged to "turn your hip"? There is no such self perpetuating mechanism in the hips wherein one can "generate movement". Your hips "permit", "allow", "tolerate", "provide for" movement, but they do not "generate" movement. In Large frame it is true the hips can be rotated forcefully once the legs push the body and they reach the apex of a weight shift. ﻿As we have stated previously, however it is also true that power is drained off once the rotation is completed. Classical (wu style) Tai chi uses a compact frame which does this by pulling. In contrast to pushing, all pulling moves are internal and stay energized. Energy is not lost but constantly recirculated and not dependent on legs for power. In talking about "fulcrums" it is of prime importance as to how one locates or places a working fulcrum. As you can see in the video the turning of hips lowers the yin/yang junction (fulcrum) to area of knees. One can readily see several practitioners of what I call "external" style Tai Chi, turning their bodies at the hips, lowering the junction to the area of the knees in the mistaken impression that "generating movement by the hips first and not the waist" can be used to "turn the body". My teacher Stephen Hwa said this about the "fulcrum" (yin-yang junction): "The most important instruction on Internal Discipline passed down from Wu Chien Chuan to my teacher Young Wabu is that": "Every movement in Tai Chi Form has to have two complementary parts of the body, a moving part (called Yang) and a stationary part (called Yin). When the yin-yang junction is located in the torso of the body, it is an internal move. When it is outside the torso, it is an external move". The video emphasizes the danger of not following the "rule" and "turning the hips". One can see several practitioners who could really hurt themselves eventually. Certainly when one is young, you can bounce back from this but as one gets older the danger of incorrect practice only intensifies. Normally, one would expect that it would only be people not trained in Classical Tai Chi who would turn at the hip and carry the torso with it, while the legs have a twisting motion. However, he recognizes several people who participated in a last years seminar in which he demonstrated this very thing. In fact, I was filming the seminar and I recognized them as well. In one case, the practitioner is turning his hips so much the legs are not only twisting...they are dancing, with the feet moving all over the floor. You can see this almost immediately and it is so very obvious. How do you remove the martial side of Tai Chi and still train Tai Chi? How do you remove the internal of Tai Chi and still have Tai Chi? There is a real inconsistency here that no one has ever managed to resolve for me. How do you present Tai Chi without giving coherent and comprehensive reasoning for it being internal? How do you say that what you do is for "health" minus martial intent in the light of many Tai Chi masters, living and dead who with martial intent lived to ripe old age in the springtime of their lives? Witness, Grandmasters Young Wabu, Master Stephen Hwa. How do you resolve an obvious conundrum in being proficient in Tai Chi by not being able to articulate and demonstrate why what you do is internal? Why put people off by telling them "what we do is for health, not for fighting"? How do you say "knowing the benefits a punch is doing for your heart and back" is more valuable than as you say "I'm not interested in learning how to punch someone"? How do you "project" energy from your arm by visualizing your heart for instance? It seems to me that certainly in one sense that we are talking about the same thing but from "external" and not "internal" perspective. That thing is "martial intent" or the lack thereof. How do you justify telling me that what you do is the only thing "good for health" and that what I do is merely learning to punch people? Apart from sparring under relatively controlled conditions and doing "external" Tai Chi, I cannot remember the last time I "punched" someone during Tai Chi. How would you justify making cutting motions with a knife for health purposes only while ignoring that the "intent" of a knife is to cut something? How do you explain the fact that one has to know which part of their arm and in this case the fist where the internal energy has to be moved beyond ("to project"). This is called martial intent. How do you tell me you have "intent" when what you do is not internal movement to begin with? Take a look at about 48 seconds into this video. VIDEO You will see an annotation at about 50 seconds which talks about Yin/Yang and junction. How do you stretch out your arms to full extent in a "punch", with the arms really to the lateral sides of the body without intent and say that it is "internal"? Try this experiment which is somewhat based on what you see Master Hwa doing. "Punch" ahead of you in the air by flexing your arm back and forth at the elbow, elbows out to the side or even pointed downward, extend the arm fully each time as you see him do. He is talking about the "junction" being at the shoulder in this one. You can do it really fast, flex/extend......... Pretty easy right? That is an "external" movement, the junction is at the shoulder as well. Now hold one arm directly in front of the "centerline" of your body, elbow down and arm not extended yet as though you are going to punch. Master Hwa does this and moves the arm with no flexing at the elbow, just a stationary part and a moving part using the core only. We will experiment a little differently. Try to extend/flex, extend/flex as fast as you did "externally" with your arm fully in front of the body as he does, keeping those guidelines in mind. Junction is now at the core and try to do what Master Hwa did, just extend/flex at the elbow very fast with arm in front as he does. Pretty difficult yes? The reason you cannot extend your arm, "straighten" it without some difficulty, is because you are "engaging" your core muscles, abdomen and back. One cannot do "internal" and external at the same time. You can do one then do the other but the two cannot operate at the same time. In this event, one would have to setup the parameters for external (elbow and arm not directly in front of centerline and more toward lateral sides of body) to successfully be able to extend the arm fully and easily once more. What is behind these true internal movements that Hwa demonstrates other than martial intent to project internal energy? How does moving arm at shoulder junction benefit your back, spine, heart, etc.? If real internal only comes from such structure, alignment, and projection as I have outlined then how can you begin to say what you do is even good Tai Chi and not just merely good exercise? What is "internal" about holding your arm to the side and flexing it at the elbow? So what is the problem with using "martial intent" considering that what one does is not Tai Chi to begin with? In any event with those parameters in mind, you cannot have intent without internal already in place. Reason is very simple and since it is not Tai Chi unless it is internal, do you have it? I have been told by students that telling them to review is "Preaching to the choir" in Classical Tai Chi. A cliche' if there ever was one...right? I hear it from students and it seems to be in a way that discourages doing it. An idiomatic expression that means "you are wasting time" and "what you are doing is useless because you are boring, annoying, I've heard it a million times and I am already persuaded." Well for one, you are listening to me. You are here because you want to be here and you want to hear "preaching". A student or potential student is not the teacher. A class needs a teacher. You can think for yourself but you need someone who can see a little further into the future and can focus your efforts. Someone who can inspire and motivate you. When I hear "you are preaching to the choir", I can certainly read between the lines because what a student is saying is that they do not want to hear the lesson again. Or, they do not have a problem, it is the other guy who has a problem. In other words the student is passively resisting what the teacher has to say. Why? It is because teaching that you do not wish to hear again is teaching that you really do not agree with. If you say you agree with me, not wanting to hear me and telling me to do something else is not a "positive" response to teaching. "Talk is cheap, put your money where your mouth is". Another cliche', but it certainly has not been "cheapened" (no pun intended) by repetition, review or great improvement. In other words, back up your "agreement" with action and committment. Things are not always a "problem" either, sometimes it simply means doing something good, helpful or better. "Better", "doing better, "get better", etc. Pure and simple, people forget, you forget, I forget, we all forget. For as long as you do Classical Tai Chi, you will have to not only learn, learn, learn but you will have to review, review, review. Want to get better? Review, and review some more. "You need to remember, sometimes the appearance of reality is actually an illusion. My students in class often told me that they thought I was moving a certain way and tried to do the same. Later they found out that their observation was not correct. That was the reason I incorporated different views in my DVD lessons, so you could see my moves at different angles to lessen the chance of wrong impression. Using a fresh eye to review the lesson DVD could also uncover any misinterpretation of my movements." I recall someone telling me they were "scolded" for offering a suggestion regarding someone's Classical Tai Chi form. The individual told them, "I know what I am doing is right because I have been doing it for "x" amount of years." That is not a reason, that is an excuse. The person and I later discussed the incident and I asked: "Why do you think they said that". He replied: "Because they do not want to get any better". How do you lift the leg? awaits his allotted time, and in this way secures his fate." "This is natural," explained the older man. "Everything has to die and has just so long to live." Ikkyu, producing the shattered cup, added: "It was time for your cup to die." Dementia, old age, lack of movement, the bain of old age? Are you doomed to merely "clinging" to life as you reach old age or do you celebrate going into it by "living in the Springtime of your life"? There are numerous studies and articles about the health benefits of Tai Chi for any age, but there should be much more written about Classical Tai Chi. As with Tai Chi in general, the health benefits of Classical Tai Chi can be examined from different perspectives and with different intensity. Unlike Tai Chi in general however, the health benefits of Classical Tai Chi will always be linked inextricably with the training of Internal Discipline which is the exclusive domain of Classical Tai Chi. It is an unfortunate occurrence of old age that the elderly begin to move more and more from the extremeties of the body and less and less from the core of the body. We hear the statement, "I feel stiff" quite frequently from elderly people, whereas one seldom hears that refrain from the young. This is an excerpt from the book Understanding Dementia, which is meant to be a practical manual for primary care physicians and other health care professionals. Chapter 6 deals with theneurological examination, which includes an examination of gait (i.e. how someone walks). "A crucial (and often neglected) part of the neurologic exam is the observation of gait. Common gait disorders associated with dementia are the hemiplegic gait, parkinsonian gait, ataxic gait and apraxic gait. The characteristics of a hemiplegic gait are well- known (circumduction at the hip, dragging of the affected foot, and lack of movement at the knee). Parkinsonian and ataxic gaits are also familiar to most primary care practitioners. The former, in its most characteristic guise, is accompanied by a stooped posture, loss of arm swing, shuffling, small steps, and festination - an ataxic gait is characterized by imbalance, and usually a broad couching stance in compensation. An apraxic gait is present when the previously learned motor activity (gait) can not be performed despite normal power and coordination of the legs. Typically the patient can stand, but has difficulty initiating gait, is very unsteady, takes small irregular steps, and their feet appear frozen to the floor. Detailed cuing (e.g. "life your right leg, now bend the knee, now put it forward.") often is helpful. This gait is consistent with both vascular disease and normal pressure hydrocephalus . " That is an interesting terminology: "Detailed Cuing" (e.g. "lift your right leg, now bend the knee, now put it forward.") This is exactly how Classical Tai Chi approaches its most basic training of Walking by using internal discipline. I find the Walking exercises, training, practice of Classical Tai Chi to be tailor made for this dilemma. One can intuit quite easily that it is important to maintain the ability to walk, what is more difficult is getting people to do it particularly if they feel unsteady. Moreso than any Tai Chi that I have experienced over 35 years, the Classical Tai Chi takes this and goes right to the crux of the problem. The elderly do not move from the core, they stoop, shuffle their steps and exhibit very little flexibility. Any training should take the "core" movement into account for the stagnation of the core is at the heart of the matter. Any training should take a cognitive approach...talking, instructing exactly(How do you lift your leg..."lift the leg by using the abdominal and back muscle, by lifting the pelvis, etc." It is part of the training to take "small steps" but with Classical Tai Chi the training makes the steps "regular". The training encompasses schooling people in how to not have "feet frozen to the floor". This is accomplished through teaching people to keep the body's center of gravity under control. Not allowing the body to fall forward as is done in the everyday common walking motion. Most importantly, one learns to pull the body forward or backward, not pushing with the legs. In this way dementia patients can work toward a visceral understanding of proper body posure, foot position, body weight distribution, all while using a highly cognitive and unique training for gait dynamics.